The overstaying charges will come for children or wife or anyone else who has overstayed in UAE for more than 30 days after cancelling their visa. Most situations arise when a sponsor lost his job and has to cancel his dependant's visa before getting his new visa. Then the family member's visa has to be cancelled who are on husband's sponsorship. You should be out of UAE within 30 days after cancelling the visa. What will happen if you stay back in the UAE for more than 30 days after cancelling visa? What would be the fine for each day of overstay? Or, will it become a police case? Read below for the answers. As per the immigrations rules, one has to leave the country within 30 days after cancellation of visa. Since the children's visas were cancelled on September 3, they are either supposed to stamp new visas or leave the country within 30 days. In case of overstay, they will be subject to fine only. Please note that it will not become a criminal case. However, your children will be subject to a fine of Dh120 each for the first day and thereafter Dh25 for each day. Furthermore, you can contact directly AMER service on 8005111, a 24-hour hotline for visa and naturalization issues, recently opened by the government for such queries. Original and copy of the relevant applicant passport. A revised fees of AED(50) will be collected per day. I want to know as I have already cancelled my residence VISA by Techom Freezone from Dubai on 28/10/2013, and now I am waiting for my new VISA from my new employer in Abu Dhabi. Grace period on my cancelled VISA is till 28/11/2013. But still my VISA is not processed by the employer. What I need to do. Should I have to exit UAE or I can wait for the VISA to process after the grace period is over with the fines. In this case can it be the possibility for police case/ deporting? You should contact your current employer and follow the procedure as per their instructions. how can i cancell my visa if my arbab is not here? The overstay fine in UAE is Dh100 for the first day after your visa cancellation or expiry and Dh25 each day for the next 180 days. It may also attract imprisonment and deportation. Is it true that the airport and immigration has different price for the overstaying case? how much is the fine after 30 days grace period is served on a cancelled residence visa? After how many days does this fine become more per day? I've heard its 120 for the first day then 25dhm per day after that. how long can i stay and pay 25AED per day before theu "up" the price of the fine? It is better to exit from the country within the grace period. After the grace period you will become an illegal resident and if captured by the authorities you will be put in jail before deporting to your home country. Sir, I recently changed my family visa within the stipulated 30 days time without exiting the country. I got the residence permit for 60 days where i should carry out the medical. After getting the medical report i applied for visa stamping, on further verification at immegration, they informed status not chaanged & extra fine for 45 days till date. I was totally puzzled & had no words to say. because nobody told me about this STATUS change !!! for family. Now what should i do? How can i get a write off for the fine sir. Appreciate your kind response. I didnot know about any possibility to write off this fine. You should have submitted an application for a visa status change along with the new residence visa application form. Hello! Please advise on our situation. We have been working on an employment visa for our housemaid's husband -- in my husband's company. He has been hired as a sales executive. He is Filipino. His extended visit visa is expiring on 7 MAY 2014. The PRO has told us his visa should be ready by today, but he has been telling us this for one week already! The problem is: his daughter is here and her extension expires on 7 May also. He cannot sponsor her of course until his visa is ready and he exits the country and returns. Can you please advise on our situation and how to best handle it? Will she also have to exit the country? My wife is pregnent and had to leave her job. Her cancellation was on 24th May 2014 and as pet law she has to leave the country on 24th June but as per the doctors advise she can leave by 4 or 5th of July 2014. Kindly advise how much fine I have to pay and will it be hard to leave the country. can someone tell me if i can pay my 35 days penalty for my visa at the airport? Hello! My visa was cancelled on 11/05/2014 and last day to exit was 09/06/2014. Meantime I got offer letter from another employer. They applied for visa and was rejected due to non availability of 6 months validity on my passport. During this time my wife's visa was temporarily hold thinking I can change the status without exit. My passport cannot be renewed from Dubai. Since I cannot obtain a phototestified letter from previous and new employer for passport renewal. After that my wife's visa was cancelled on 10/06/2014. Now both of want to exit UAE. I have booked a ticket on 19/06/2014. Is there any legal problems and how much will be the fine. Please guide me. I am in real trouble. Hi Aneesh, please report to immigration department along with original passport & airticket copies. My family's residence visa was now on hold,and their grace period was over.But I already done the change of status and entry permit before the last date of grace period.Sir,please tell me should they pay fine ,or I have to submit my family's new stamped visa to avoid overstay fine. my grace period will over on 2nd December 2014. my new employer will provide visa after due date,can i overstay till 18th DEC what fine i have to pay ? I have a friend. She is been over staying here for 1 year and 6 months now. She check in court what is her status they say she dont have any complain. She wanted to go to her country but she is afraid that maybe they bring her in jail. How can she pay for her fine? And what will happen to her if she pay the fine? They will put her in jail even she pay her fine? And when she go back to her country is there any possibilities that they give her a ban or a blacklist here in UAE? If they give her a ban how many months or year maybe? Pls some one help her...if some one knows about what will happen to her.. And what is the right thing she needs to do.. Thank you..
Hi sir i want to asked if the cancellation of visa is 1 month because im waiting long time i past resegnation to my company december 16 but telled i need to go 45 days work so i go 45 days work and i stop january 29 and i pay also 1800 but till now my visa not cancelled ehat should i do..
My understanding is that Medical report is valid only for one month and your company has to renew the visa before the medical report expires. Otherwise they have to do the medical again. In any case your company will be responsible for the all charges related to your employment visa. Labour law is very strict now and company will not able to continue their operations without renewing employee visas. hi my visa is expire on april 12 and my cancellation will be done by may 12, from my new employer i will get my new freezone visa in another 10 days time, in this case, am i illegal to stay or i can pay fine and solve this without any litigation. My visa ended last 24 May 2016 and i am already over stay now but this 30 May 2016 i will be going for exit how much is my penalty? Hi I had 1 day over stay on my previous visit in uae. And I paid fine at the dubai airport around 300 Dirhams. After my Exit I have applied for my new visit visa, but visa is not yet confirmed. Its showing security check. Nownita one week over. 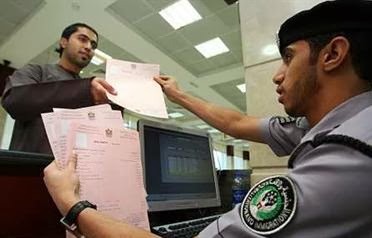 Is there any ban for to entry in uae? Please help me. I have some problem please can you help for this prblm actually im working in dubai since 2014 my employment visa can't make renewal so my company will give me cancellation pepar and I find anthor job in abudhabi recently 15/12/16 but my cancellation pepar have one NOTE should leave country or change status before 17-12-2016 so im staying extra days if any problem for me in airport bcz im leaving country aftor toomarow..? I want to if anyone comes to UAE on visiting visa and overstays for a month what will be the fine he has to pay and what are the ways and procedures for him/her for going out to home. And, what will be fine he/she has to pay for overstaying on visiting visa for 10 months ?